When I walk in the streets of Paris I hear voices. And if I’m leading one of my Black history in Paris tours, those voices flow through me and out to the participants who are eager to hear the stories lodged in these walls, along the narrow streets and grand avenues, and inside famous and off-the-track sites. The voices I bring to life belong to African-American writers, artists, intellectuals, entertainers, former slaves, military and educators who chose to expatriate or to explore for a time the Liberté, Egalité, Fraternité denied them at home. When they first spoke to me, I was in my mid-30s. I, too, had expatriated, from Canada. My first child was still in maternelle (kindergarten), and I was moving from one freelance job in the film and television production world to the next. What abruptly changed my direction was taking one class. My teacher turned out to be the expert in African American history in Paris, the late Professor Michel Fabre, founder of the Centre for African American Studies at the Sorbonne Nouvelle. Suddenly, after four years in Paris, I felt connected to a thread so much denser, influential and personal than my preoccupations of just surviving. I’d stumbled into 200 plus years of virtually invisible cultural nourishment and it became my story to tell. In the 21 years since creating a series of tours inspired by Fabre‘s work, those voices have mirrored changes of my own. In the first years, when I lead a group from rue Christine in the 6th district to rue Dauphine – facing what was the first major jazz cellar in postwar Saint-Germain-des-Prés – I would recount how author Richard Wright‘s direction of thinking changed because of his ongoing discussions here and in nearby cafés with like minds such as Jean-Paul Sartre. Identifying with Wright’s evolution gave me a rebuttal when my family back home would look at me kind of sideways and say: “You never used to think that before”. I sure hope not, for wasn’t that the point of immersing into another culture? Adopt what works in theirs, modify outgrown ways of your own. It was true even back in the 1780s for Sally and James Hemings, leaving the U.S as slaves to then-diplomat Thomas Jefferson but in Paris legally free people. When our tour bus cruises down the Champs-Elysées and passes the location of the official residence, I do a little internal happy dance for them. I found myself goaded and guided to persevere by the determination of early 20th century women. Until the outbreak of WWII, a Paris sojourn for artists was short but very powerful and life-changing. On rue de Seine, just a stone’s throw behind the Louvre and lined with art galleries, our tour participants also loved to hear how the intrepid artists faced down obstacles and to see images of the resulting artwork that propelled their personal power and career. In the shadow of the Ecole des Beaux Arts, we all nod, feeling justified that although sculptor Meta Vaux Warrick was refused accommodation so as not to offend white students, her work prompted none other than Rodin to declare “Madame, you are an artist” and to become her mentor. Chronically impoverished Nancy Elizabeth Prophet regularly had to choose between buying food or sculpting materials. Stomach growling, she exhibited often at professional salons held at Le Petit and Grand Palais. 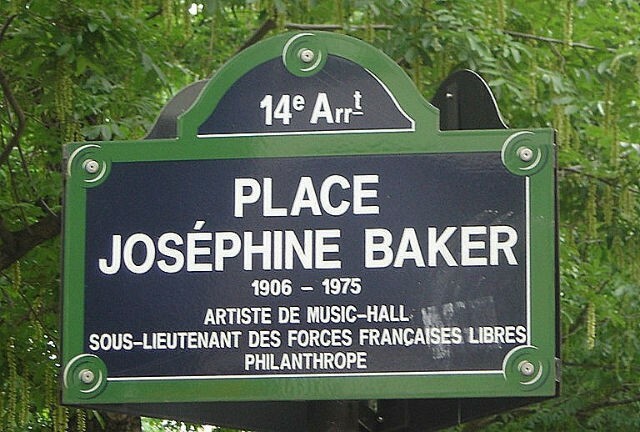 The voice of Josephine Baker has always reminded me that Paris dangled that rare chance to reinvent oneself. On our bus and walking tours, we follow her journey from chorus girl at the Champs-Elysées Theatre to star diva at Folies Bergères, activist in the Latin Quarter, and awarded the Legion of Honor. But it is in Lower Montmartre that I feel her inventiveness and vision dovetails with the effervescence of Black Montmartre of the 1920s. Here musician-soldiers who introduced jazz to France during WWI now revolutionized French music. Here, Bricktop‘s clubs brought together international admirers from F.Scott Fitzgerald, Cole Porter, Gloria Swanson, the Prince of Wales and budding musicians Django Reinhardt and Stephane Grapelli. Julia tours with students on rue de Seine to discuss pianist Bud Powell’s time in Paris. Photo courtesy of Julia Browne. Whether I or one of my guides leads our tours, we hope that our participants of all backgrounds feel connected to the common thread of Black voices. Because in the end, the story of searching for better opportunity when you can’t find it at home is a universal experience. To learn more about the rich heritage of Blacks in France, consult Julia’s website Walk the Spirit. Julia Browne helps visitors get an in-depth, unique French travel experience so that they can effortlessly discover the soul of France and gain an Afrocentric perspective like they’ll find with no other professional. British-born and Canadian-raised, Julia studied in Aix-en-Provence then lived in Paris raising her family there for over 10 years. She launched Walking The Spirit Tours - the first Black Paris-focused tours - in 1994. In addition to the signature tours, she is a Certified Destination France Agent who truly enjoys designing customized itineraries that blend Black history like jazz with authentic cultural, culinary and artistic activities in France and beyond. An award-wining broadcaster and captivating speaker, Julia gives lively presentations on Black Paris at cultural and educational institutions.